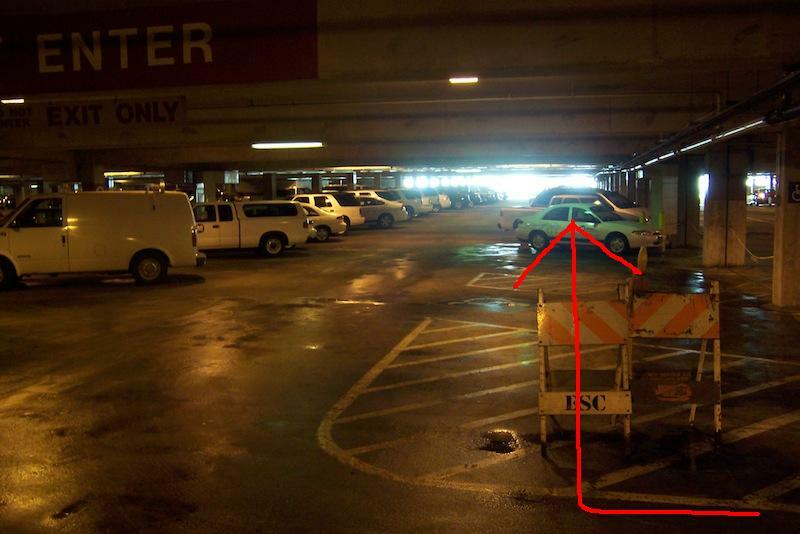 The arrow points to where parking spaces will be removed and pedestrian walkway built. Parking spaces being turned into a pedestrian walkway?? What?? That’s exactly what will be happening at the Gateway Arch Garage on Washington Avenue. Construction work is scheduled to begin on Tuesday, June 1, and be completed around June 25, right before the Fair St. Louis festivities. The pedestrian walkway will displace a row of Metro pool car and staff parking spaces to connect Washington Avenue and the Arch-Laclede’s Landing MetroLink Station with the garage elevator and stairs to the Arch grounds. The pedestrian walkway will include an ADA ramp from Washington Avenue into the garage, as well as improved lighting and a steel fence. During construction, Arch visitors will use a temporary pedestrian path to the east of the construction. Hopefully, it will make the pathway between the Landing and the Arch grounds more inviting and accessible for all. This is awesome! Glad to see Metro working to make a more pedestrian friendly city. Does metro operate that garage or just have space in it? This sacrifice is a healthy sign from the organization. How many metro employees drive to work anyway? Yes, Metro owns and operates the Garage. Not sure if we know how many employees drive to work versus bike/walk/transit, though I suspect we will be tracking soon. There’s a lot of us who transit in. The best that could happen to this garage is demolition. Anything else is merely window dressing. The most idiotic location for a garage in the City. Pull it down and recycle the concrete. The garage does not have free parking, even for Metro employees. The walkway is to improve safety and useability of the garage, for autos and people alike. Hopefully, some decent signage (i.e. directions on where to walk to get to the Arch and Landing) gets added as well. Seems like you almost have to be a local to use that garage efficiently. One of the worst garages in the city, IMO. Signage is a part of the project. I’d say this is a “safety and wayfinding” project, which means the design is specifically to help people find their way while improving safety. I doubt Metro will lose any revenue because the number of spaces being taken is minimal and the garage is not usually at capacity except during special events. The parking in the garage is not free, not even for Metro employees. Metro provides transit passes to employees so we don’t need to park! As for the sense of the garage, I think it definitely serves a need on the riverfront. People drive in from out of town to see the Arch and they may not be familiar with MetroLink. I’d much rather see the parking contained in a garage and work towards infill where there are surface lots on the Landing – sort of a “highest and best use” approach to the very real need for parking at this important spot. So Metro is charging itself to park its pool vehicles there, as well?